According to nationalmortgagenews.com, The surge in mortgage rates since the November election is expected to offset the increase to lenders' short-term funding costs following the Federal Open Markets Committee's 25-basis-point increase to the federal funds rate Wednesday. The federal funds rate doesn't directly affect the interest rates that borrowers pay on home loans, as mortgage rates are benchmarked against longer-term 10-year Treasury yields. But depository and nonbank lenders are both expected to see their short-term funding costs go up, albeit in different ways. "Anything that's a warehouse line or something like that is going to go up in price," said Brent Nyitray, director of capital markets at iServe Residential Lending in Stamford, Conn.
For banks, the fed rate influences their cost of funds for the deposits they use to fund mortgage originations. Likewise, the warehouse lines of credit that independent nonbanks use to fund their pipelines until loans can be sold to end investors are pegged to the London Interbank Offered Rate or the prime rate, which are influenced by the fed funds rate. But the increase in that short-term rate isn't so much a concern as long as it's offset by a rise in the long-term rates most mortgages have. The average interest rate on 30-year mortgages has gone up nearly 60 basis points since the week before the election. The rise in mortgage rates is enough to offset the increase in short-term rates, plus warehouse lines are not a big cost for mortgage lenders, said Charles Clark, director of mortgage warehouse finance at EverBank. "I don't think there's going to be a big effect on mortgage bankers at all. You're moving the goal posts, essentially," he said. 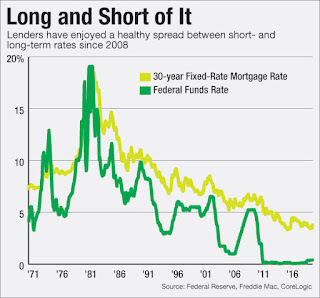 But if the curve between long- and short-term rates or yields were to flatten, lenders would feel their margins slightly pinched by higher funding costs. "It would really hurt everybody if the curve flattened because the cost of funding would go up relative to the note rate on the loan," said Tom Millon, president and CEO of the Capital Markets Cooperative, a subsidiary of Computershare.